...providing you live in Nottingham of course! I posted on Facebook earlier today the hypothetical question (I used the word 'hypothetical' quite a lot because 'literally' has been taken) about whether I should stage my own gigs. What happened next made me decide once and for all to do it, so as soon as I can get it organised I am going to bring you The Sunday Alternative Live! 1- Sunday evening, once a month. 3- All individual sets filmed for The Sunday Alternative YouTube channel. 4- All individual sets recorded for the audio podcast or special editions. (In the case of 3 and 4, this will be on a joint-ownership basis. I am allowed to upload and broadcast on the podcast and you are free to sell the audio by download/CD/cassette/other format yet to be invented and do what you like with the video). 5- Moderate door charge of maybe £2 or £3. This will be divided equally between the acts as artists should be paid. An 'act' is defined as however many people appear on stage; a solo artist with a guitar is an 'act' and so is a twenty piece band. 6- Acts share the responsibility of promotion on their various social media platforms, especially as due to my fractious relationship with those who preach live music gigs without going to them, it isn't likely to crop up in any picks of the week. The more people through the door, the more door takings, the more door takings, the more you leave with in your pocket. All I need now is a venue. 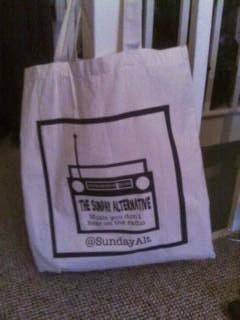 Stay tuned to @SundayAlt and @SteveOliver76 (and the Facebook pages /The SundayAlternative and /SteveOliverOfficial) for details.